The late Italian double bass master Stefano Scodanibbio, who died untimely in 2012 after a battle with the ALS disease, was a unique artist. A musician who expanded significantly the vocabulary of the double bass, exploring its almost infinite timbral range, and inventor of many extended and experimental techniques. He was also a unique composer and interpreter of of 20th century ground-breaking compositions by such composers as John Cage, Giacinto Scelsi and Iannis Xenakis and a role model for forward-thinking double bass players coming from the fields of free jazz, free improvisation and contemporary music. German double bassist Sebastian Gramss (who performed with Scodanibbio) composed and arranged this wise, heartfelt tribute to the seminal art of the late master. He assembled an elite international group of eleven double bassist masters in their own rightAmerican Mark Dresser, American, France-based Barre Phillips, German John Eckhardt, Christine Hoock and Dieter Manderscheid, British Barry Guy, French Joëlle Léandre, Italian Danielle Roccato, Japanese Tetsu Saitoh and Norwegian Hakon Thelin (who released recently his own excellent tribute, A Stefano Scodanibbio, Atterklang, 2014), all of them well-versed with the work of the late masterto perform a ten-movement suite dedicated to Scodanibbio's creative vision. This suite was recorded by each of the musicians in his home base, following Gramss' loose instructions. Due to the unpredictability of the players' contributions, Gramss decided not to write long, continuous movements, but to create a number of shorter combinable modules, which were connected after the recording was done. This impressive composition celebrates Scodanibbio's musical vision in two ways. It leans on his major compositions and workmainly his Voyage That Never Ends (New Albion, 1998) and the multitrack Oltracuidansa (Mode, 2010) and emphasizing the influence of composers Morton Feldman, Conlon Nancarrow and György Ligeti on his compositionsand explores his new forms and approaches of playing the double bass, recreating anew the sounds and timbral range of this instrument even further. The inspired performance of this demanding, multi-bass compositions succeeds in shedding light on Scodanibbio's innovative and profound vision. The second part of the album offers short solo impressions by the eleven double bass players of the art of Scodanibbio, reflecting on their own personal connection, influence and inspiration by Scodanibbio's art. These imaginative and poetic masterpieces explore even further the surprising vocabulary of the double bass. All the musicians, each in their own distinct way, refuses to play the double bass only as a double bass and all explore different aspects of their own musical world, expanding on Scodanibbio's innovative techniques. Gramss' "Voyager" highlights his work with the bow as a percussive means and is simply spellbinding. Barry Guy plays the double bass on "Outside-Inside" as if it was a lute, a Japanese koto or a harp, blurring any distinction between these string instruments and the double bass. Christine Hoock abstracts Scodanibbio's tribute to Jimi Hendrix' "Foxy Lady""& Roll"with her "Rock! Nella Nebbia," a much gentler yet infectious rhythmic work with the bow. Léandre storms with a minimalist, emotional "For Stefano." Daniele Roccato demonstrates his fascinating, poetic bow work on "Breaking Glass." Håkon Thelin magical exploration of overtones and multiphonics on "h-Moll/D-Dur" is a beautiful conclusion to this chapter. The album ends with a bonus track. The previously unpublished Scodanibbio composition, "Virtù," recorded live as a duo of Scodanibbio and Gramss from the Altstadtherbst Festival in Düsseldorf in 2008. This masterful performance, as well as all the compositions and tributes to Scodanibbio portray beautifully the late master as true force of nature, a prominent figure in the history of the double bass in modern times. A great farewell to a great master. 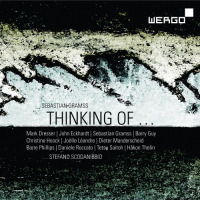 Track Listing: A Catena; Macchina Basso; Fioritura; Spirale; Un Vento Silenzioso; Moto Perpetuo; Pezi Difettosi; Sui Viaggio; In Altre Parole; Soffermiamoci; Mark Dresser: Sostevoli Su; John Eckhardt: La Coda del Nebbio; Sebastian Gramss: Voyager; Barry Guy: Outside-Inside; Christine Hoock: Rock! Nella Nebbia; Joëlle Léandre: For Stefano; Dieter Manderscheid: Subito Sera; Barre Phillips: Tocarme; Daniele Roccato: Breaking Glasses; Tetsu Saitoh: Casino; Håkon Thelin: h- Moll/D-Dur’ Stefano Scodanibbio/Sebastian Gramss: Virtù. Personnel: Sebastian Gramss: Double bass (1-10,13,22); Stefano Scodanibbio: double bass (22); Mark Dresser: double bass (1-10,11); John Eckhardt: double bass (1-10,12); Barry Guy: double bass (1-10,14); Christine Hoock: double bass (1-10,15); Joëlle Léandre: double bass (1-10,16)’ Dieter Manderscheid: double bass (1-10,17); Barre Phillips: double bass (1-10,18); Daniele Roccato: double bass (1-10,19); Tetsu Saitoh: double bass (1-10,20); Håkon Thelin: double bass (1-10,21).